Last weekend I took my first significant road trip of the summer, a solo drive from Toronto, Ontario to Allentown, Pennsylvania. I covered over 1400km in less than two days. It is a trial run before another solo trip in June when I’ll drive between Thunder Bay, Ontario and Apostle Island, Wisconsin. I am not a fan of solo driving trip because my chronic insomnia makes it extra difficult to stay awake behind the wheels. Weaning myself off caffeine a month ago certainly is not helping. However, due to all my recent emotional turmoil, I much rather be by myself than locked in the car with other people. I am not in a good place mentally. That still leaves me with the troubling task of staying awake while on the road. I discovered years ago that I am not capable of dozing off when I am chewing and swallowing. Road trip snacks take on different significance. They are literally my lifesavers. While I would love to munch on chips and pretzels, I shudder with horror at the caloric prospect. Instead, I snack on baby carrots when I feel virtuous and mini marshmallows when I am not. Not terribly interesting? 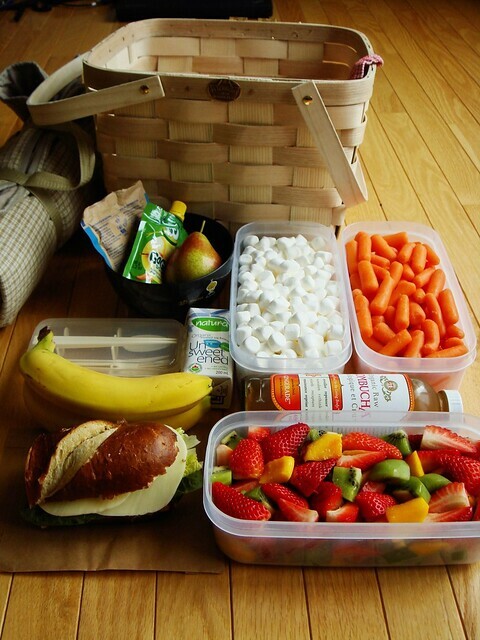 Just wait until you see what I else pack for lunch and breakfast on the go…in a stylish picnic basket no less. I get motion sickness easily. On bad days, even when I am the driver. Ginger is a traveler’s best friend as it calms the stomach. This is why I packed a bottle of ginger kombucha in my basket. It’s a little sweet, a little spicy, and a little funky. Similar to yogurt, all the good bacteria that ferment the tea help to keep the colony of bacteria in my stomach happy too. Fresh fruit is always refreshingly welcome on long road trips. The quality of fresh fruit available at gas stops is pathetic at best. That is why I relish my container of fancy fruit salad. I filled it last week with a mix of strawberries, kiwis, and mangoes. They made for healthy dessert at my road side picnics. 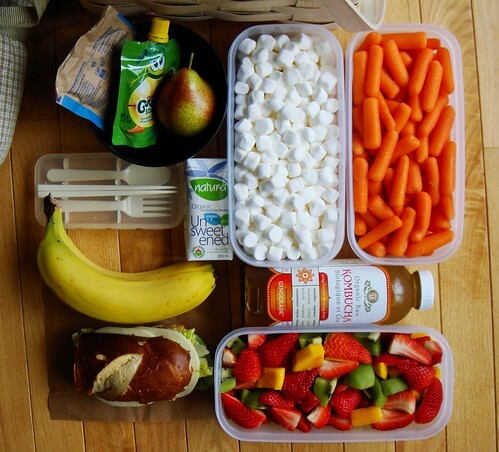 Pear and bananas are also easy-to-pack quick snacks. I am not a fan of fast food. Unfortunately, it is often the only option when stopping for lunch or dinner on the road. That is why I pack my own lunch instead. When I have time to plan, bento would be my first choice. 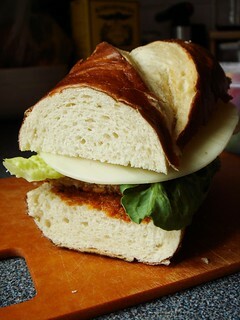 Since I was short on time last weekend, sandwich was the logical choice. With extended time traveling at room temperature, my sandwich needs to be filled with low-risk ingredients that would not spoil so easily. 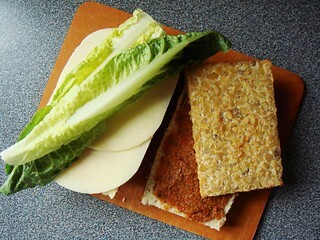 I made a pretzel roll sandwich with sundried tomato pesto (bold flavour), toasted tempeh (high quality protein), romaine lettuce (a bit of crunch), and provolone cheese (savoury). It held up extremely well throughout a whole day of travel. For breakfast, I packed my standard race day morning combination. A packet of unsweetened instant oats, resealable unsweetened applesauce, and unsweetened soymilk. I mixed the three together like a bare bone muesli and downed it with some fruit salad. It may not be glamorous but it is certainly healthier than the complimentary hotel breakfast buffet. It keeps me satiated without weighing down, an important criteria before racing. 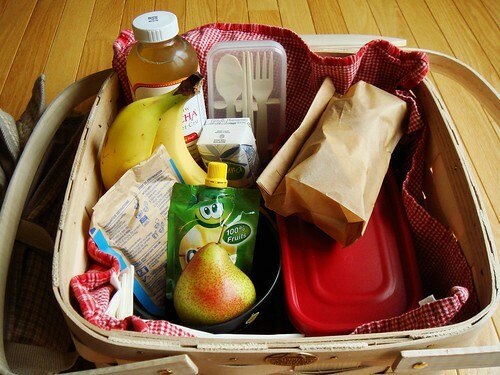 Don’t forget to pack travel cutlery set, a bowl, and some napkins! 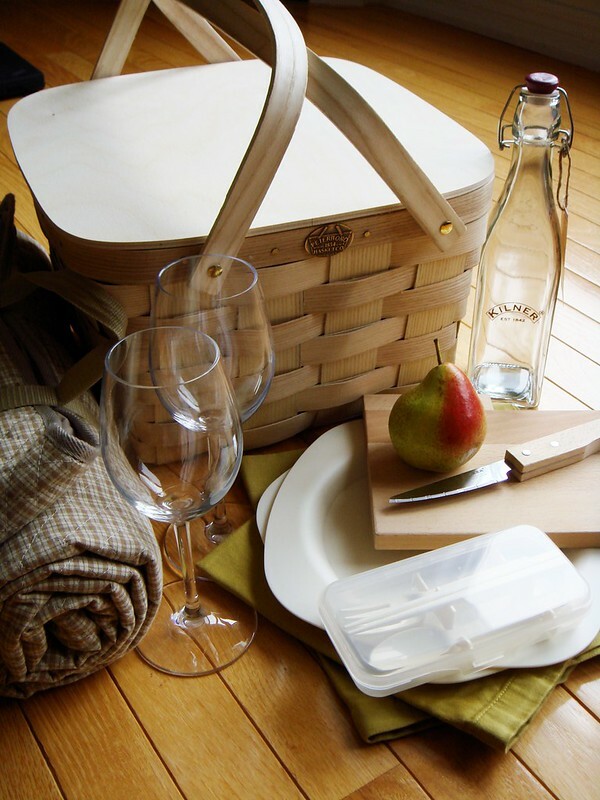 Peterboro hand weaved basket (available now at Crate & Barrel! ): it holds up to 30lb and is the perfect size for two. The basket comes with a stand that fit inside so it is actually a double-decker pie carrier. That can be used as a shelf to separate items inside the basket. Muji picnic blanket: I bought this in Hong Kong in 2001. At the time I thought it was the most absurd purchase but I loved it so much. Thank goodness my Mom talked me into buying it. President’s Choice acrylic wine glasses and corn-composite plates: lightweight and non-breakable. Dining on real plates and sipping from real glasses feel so much nicer. Japanese bento cutlery set: each set comes in its own box so even the dirty cutlery will not get mixed up. I love to include chopsticks because they are just so versatile. Kitchen Stuff Plus chartreuse napkin: dark enough that stains do not show easily. Ha! IKEA portable cutting board with picnic knife: immensely useful for cheese, sausages, cakes, and fresh fruit. Kilner beverage jar: for my homemade flavoured sparkling water. Such a pretty shape. 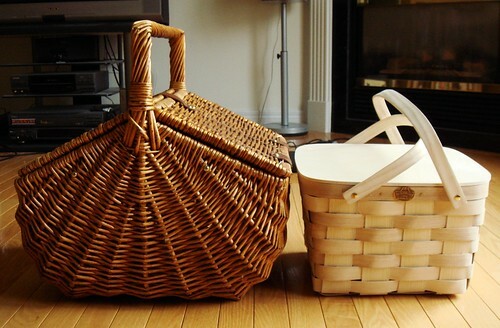 Last but not least, I’ll leave you with a comparison of my old wicker picnic basket for 4 versus my new basket. I really like the smaller size. Now I can picnic in style even if it is only a solo road trip!